After twenty-three years in Japan, I finally went to see Hiroshima City. Other than the Peace Memorial Park (right side of the river above) and the remains of the Hiroshima Prefectural Products Exhibition Hall (left side of river above - now known as the Atomic Bomb Dome), there is nothing in the city (that I could see during my short two-day stay in any case) that indicates what happened to it on August 6th, 1945. Still, places have their atmospheres and echoes from the past, so I looked around and tried to comprehend how the city is now and how it was in the past; with that day in August 1945 being a wall between normalcy and a hovering horror (one device in the sky - boom - city destroyed; it shouldn't be that quick and easy to destroy an entire city). To get to Hiroshima from Tokyo, I went to Tokyo Station and climbed aboard one of the sleekest looking Shinkansen super express trains (out of several types) and took the journey down to Hiroshima in style and speed (300kph in places). The beauty of traveling by train is that you can actually see and contemplate the land you are traveling over/through. The Daihatsu factory in the picture below is typical of many factories in the countryside (although a lot of Japan's manufacturing has been moved overseas). Daihatsu is one of the kei-class car manufacturers here, and Daihatsu was famous in Japan as far back as about 20 years ago, for their one-liter, three-cylinder diesel engine, that burned amazingly low amounts of fuel (I drove a Daihatsu Charade myself from Tokyo down to Kyushu and back in about 1986, only burning something like 5 liters of diesel per 100km). If you can read Japanese, notice that it says "Daihatsu Diesel" beneath one of the red "DAIHATSU" signs. (Above) - The streetcar stop in front of Hiroshima Station. Taking a street car for about 10-15 minutes brought me to the stop in front of the remains of the Hiroshima Prefectural Products Exhibition Hall (the current Atomic Bomb Dome). Initially, as I got off the streetcar with some other tourists (from Japan, not overseas, although I noticed some foreigners here and there later in the day), it felt like most tourist destinations, with people standing around taking pictures of the local historical interest and reading explanations on plaques. The Dome Building tells its own tale, but I was disappointed that I couldn't get up closer to it. Seeing something from a distance is a little like seeing a picture of it. (Above) - Walking away from the Dome Building (partially visible on left), towards the bridge that leads past the former Taishoya Kimono Shop (visible in the center of the picture - later used as the Fuel Hall, and now the Rest House), and into Peace Memorial Park. The Rest House (a tourist information center) turned out to be a more meaningful and interesting building for me than the Dome Building (more on that later). 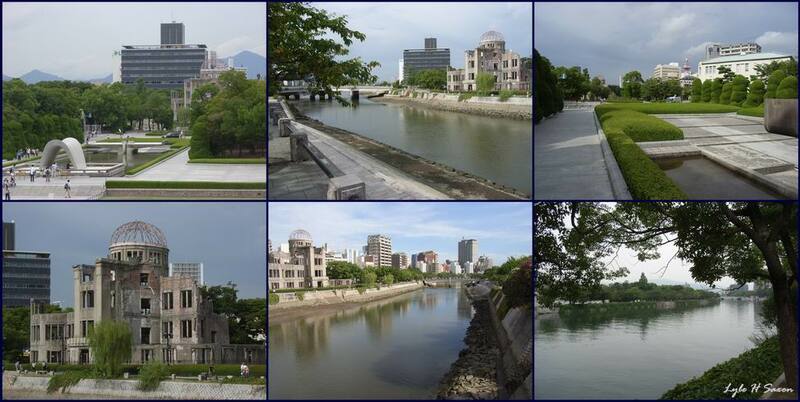 (Above left) - The Dome Building before it was 90% destroyed, (when it was either: a) the Hiroshima Prefectural Commercial Exhibition Hall, b) the Hiroshima Prefectural Products Exhibition Hall, or c) the Hiroshima Prefectural Industrial Promotion Hall). (Above center) - The Rest House (when it was the Taishoya Kimono Shop, later to become the Fuel Hall, before its current use as the Rest House). Note that this picture is distorted, making it look as though the building is at a sharp angle, when in fact it's a standard 90 degrees. (Above right) - Another view of the Dome Building on the right side of the picture. The concrete building on the far left (partially visible) also survived the blast (as an empty shell with a buckled roof), but the building in the middle (apparently made of wood) was completely obliterated (based on aerial photos I've seen taken shortly after the blast). Inside Peace Memorial Park. (Above left & center) - Looking towards the Dome Building. (Right) - Half of the Peace Memorial Museum (connected by the elevated walkway). (Bottom) - Views in and around Peace Memorial Park. (Bottom lower right) - Just downriver from the Dome Building, there is not a trace of what happened in 1945 - which is the reason for the preservation of the Dome Building. Inside the museum, you come face to face with the immediate aftermath of the explosion that destroyed nearly the entire city. There seems to be a widespread misconception that the Dome Building was the only thing left standing. Actually, many structures fared better than the stone, brick, and wood Dome Building - notably steel-reinforced concrete structures. Their windows were blasted out and (almost) everyone inside killed, but the (burned out) structures stood, as you can see for yourself in these photos. Many bridges, while damaged, also withstood the blast and were usable afterwards. (Above left) - The bomb exploded at 8:15 a.m., August 6th, 1945, and this was taken at around 11:00 a.m. on the same day, about 2,270m from ground zero, by Yoshito Matsushige, a photographer for Chugoku Shinbun Newspaper (whose own house was half-destroyed in the blast - he pulled his clothes and camera out from under the rubble of his home and went out for pictures). He couldn't bring himself to photograph the more horrific things he saw that day, and had to force himself to take even the five pictures he did take. Taken less than a few hours after the blast, these people were mostly injured schoolgirl volunteer workers (who were clearing areas in the city as fire breaks around military installations, since conventional bombing was expected at some point) lining up for help at a makeshift first-aid station at a police box near Miyuki Bridge. This is one of the large photos in the museum - studying the details of the individuals in the photo brings home some of the misery and horror of the day. 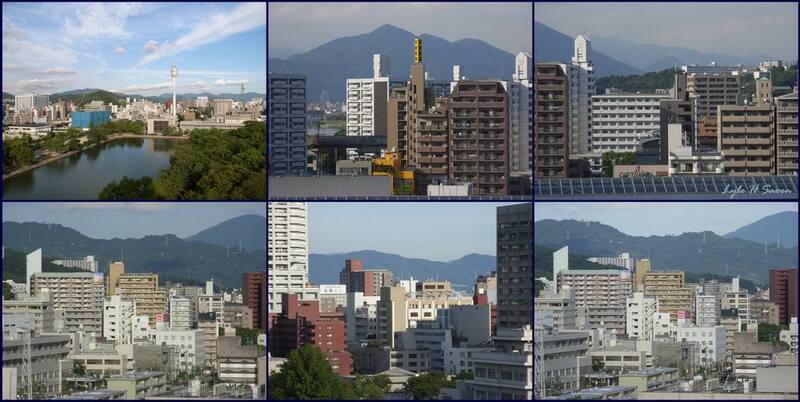 Yoshito Matsushige's five pictures taken that day are the only known photos taken on that day within Hiroshima city. (Above right) - Taken days (weeks?) later. The buildings in the distance look deceptively small. The tallest of them is about ten to twelve stories high. You can also see people walking on a road on the right side of the picture. (Below) - A photo taken some time after that day. Notice how more than half of the Dome Building has collapsed. It looks more whole from the front, but in this view of the side and rear, you can see that nearly everything above the first floor collapsed (and burned). Back outside after spending some time in the museum, you look around at today's Hiroshima and try to comprehend the whole picture - the beginnings of war when there were only angry words, and then the escalation of destruction and death. The recovery of the city - the fragility of the city - the horrible thought that the bomb that destroyed Hiroshima was quite small in comparison to more recently manufactured atomic bombs.... You think of the city you live in, and it's unsettling to contemplate the reality that it could be destroyed in a few seconds. (Above right & below left) - (Rebuilt) Hiroshima Castle, about a fifteen minute walk from the Dome Building. (Below) - Views from the top of Hiroshima Castle. After walking about the city for a few hours (above three and below center), I went to an okonomiyaki restaurant (below, left). Every area of Japan generally has a food it's famous for - okonomiyaki is famous in both Osaka and Hiroshima (but is available in all cities I think). It's sort of like a non-sweet pancake mix that is cooked on an open hot plate with various kinds of ingredients mixed in (according to what you like, which is where the name comes from - meaning something along the lines of "Grilled what-you-like"). What with seeing the remains of the ruined building and the museum, I had naturally been thinking about August 6th, 1945, but it was mainly regular-process thinking - you know, you see a picture and you take in the details, or you read a story and think about the words and what's between the lines - just normal thinking. Then, as I lay there on the bed around 5:00 in the morning, beginning to drift halfway back into sleep, a non-regular-process... feeling/image/concept/perception came to mind. It's impossible to explain properly in words, but it was a sensation of a horrendous force slamming into the ground. All day I'd been seeing photos and whatnot, and thinking about them, but mainly my thoughts were of burns and buildings knocked down with a horizontal force. The conscious realization of the sensation jolted me wide awake - ending the impact perception.../something, but like a fleeting memory I still have from the middle of rolling a car back in 1977, I can recall a fraction of the feeling when thinking back to the moment. (Above right) - The rear side of the Fuel Hall (former Taishoya Kimono Shop, current Rest House). Notice the basement windows at the very bottom of the picture and the broken edge of the roof above. These windows being on the side of the building away from the epicenter probably saved the building's lone surviver - Eizo Nomura, a man who had been in the basement at the time of the blast (there are no such basement windows on the two sides of the building that were hit with the direct force of the blast). The entrance to the basement was also on the rear side. I hadn't had time to go into the Rest House the day before, but it caught my attention for some reason when I walked past it, and after reading about it, it felt like something I needed to see. Rather than a hollow ruin, here was an intact building that was still in use, and it was very near to ground zero (100m away by most accounts I've read, although one stated 170m). "The Rest House is the only remaining original building in the former Nakajima area. Built in March 1929, this three-story building (plus basement), was modern and innovative at the time it was built. In 1944, the Hiroshima Prefectural Fuel Rationing Union purchased the building and it became known as the Fuel Hall. 170m [100m by most other accounts] from the hypocenter, it was gutted by the A-bomb, leaving just the basement and the framework of the building intact. 37 people who were at work at the time, perished. The only survivor was Eizo Nomura. Nomura lived until 1982, dying at the age of 84. The concrete which surrounded the vault and thick earth prevented the shock wave, thermal radiation, and ionizing radiation from affecting him." (Above left) - The area in front of Hiroshima Station. Heading out on my second day in Hiroshima, I returned to the streetcar stop in front of the main station and took a streetcar back to Peace Memorial Park and the waiting Rest House building. (Above right) - I seem to remember reading a couple of decades ago about the stones along some of the streetcar lines having been blackened from the blast and fires of August 6th, 1945, but I haven't been able to verify that yet. If anyone has information about this, let me know and I'll update this page. (Above left) - Looking out the back of the streetcar on the way to the Dome Building. (Above middle) - A part of the ruins of the Dome Building. (Above right) - A sculpture near to the Dome Building. (Below) - This is the (since rebuilt) bridge that Eizo Nomura crossed soon after leaving the Fuel Hall (see text below). (Below middle) - Two parts of the original bridge. Another two are incorporated into the new bridge. By all accounts I've read, Eizo Nomura was the only (long-term) survivor from the Fuel Hall, but from his account, there were seven other (badly injured) people (all from the Fuel Hall? ), but apparently the others succumbed to radiation and their other injuries. 'We noticed that in some places on the Motoyasu River, the water was rising. Just then, it started circling and whirling and climbing high into the air in a cylinder. It was a waterspout! From the top, the water fell in the direction of the wind. The fire was getting more violent. We found ourselves attacked by smoke and sparks from the other side of the river. We climbed the stone steps in terror, running toward an open space. Now sparks from that direction attacked us. With no other choice, we returned to a corner of the stone steps we had been on before and huddled in a small group. Again and again, we dipped the tin roofing we were using as a shield into the river, and endured.'" "He barely escaped toward Koi through furious fire and thick smoke. Later he hovered between life and death with high fever, diarrhea, bleeding gums, and other acute effects of radiation." (Above left) - Looking upriver towards the Dome Building (left middle) and Rest House (left, out of sight behind trees). (Above right) - The front entrance to the tourist information center (current Rest House, former Fuel Hall) building - which faces the direction the blast came from. The only entrance to the basement (see photos below) is from a door on the back side of the building. Walking into the Tourist Information Center expecting to be able to just walk down to the basement from there (not yet knowing about the rear entrance), I was perplexed not to find any evidence of stairs leading down, so I asked a woman at the counter about it, and she said that it could be seen by request only, and gave me a form to fill out (in Japanese). After filling it out, she called somewhere and said that a visitor was on their way to see the basement, and then led me outside of the building and back in through a side entrance (since the front of the building is a corner, the back two sides could be called either sides or the rear of the building) that led to stairs going up on the left, and - at the end of a dim hallway - stairs going down (to the right, but in the same direction as the hallway). Opening a metal cabinet with several hard hats in it, she took one out and handed it to me, saying that I was required to wear it when visiting the basement. I took it, dutifully put it on my head, and she hurriedly went back outside. As people generally will guide you all the way to a destination here, I thought it odd, but proceeded to the top of the stairs and took a picture of the old wooden handrail and narrow stairs leading down (see photo below). Walking down, I was struck with an acrid smell... my first impulse was turn around and get out of there double-time, but I wanted to see what was in the room and I continued on.... Looking ahead, I saw an exhaust fan that was in one of the small windows up against the ceiling on the far side of the room, so I walked over towards it stupidly thinking that it might be blowing air in - it wasn't, it was blowing air out - but by then I was in the space, so I took some pictures and looked around. It was an empty basement basically, so I was initially surprised, as the words "has been preserved just as it was when the building withstood the A-bomb" in a tourist guide I'd read led me to believe that there were still things in there from before August 6th, 1945 (not logical, but...). The strange thing is that as I took pictures, it almost seemed like any old concrete basement that could use more ventilation, but after leaving the space and thinking back, that space and that acrid smell scare me. Suddenly I understand why the woman didn't go near the stairs leading down and got away from there in a hurry. And the lack of ventilation... how long does radiation from an atomic bomb blast at ground zero hang around in a poorly ventilated underground space? (The exhaust fan was turned on and the door opened after the phone call I presume.) I was only in there for two or three minutes, but somehow the memory of the place seems to be growing into something more... scary? Frightening? Dangerous? For some reason, I thought I really wanted to see that space, but I think it conveyed more to me than I bargained for somehow. The next time I visit Hiroshima, I don't think I'll go back to that basement - once was enough. (Above left) - The stairs leading down into the basement. These are the very stairs that Eizo Nomura climbed to exit the building after the blast. (Above & below middle pictures) - Obviously they removed the walls that used to be there (note grooves in concrete pillars). I imagine having walls between the survivor and the only windows in the basement (even though they faced the back side of the building) may have helped save the person as well. (Above right) - A dysfunctional exhaust fan - possibly the original one that was installed when the building was new? (A working exhaust fan is further to the right.) (Below right) - There appears to be a (now dysfunctional) pump-driven well. Japan gets a lot of rain, and it used to be common for people to get water from wells in many neighborhoods. Back when I was wandering around Tokyo taking videos in 1990-92, I came across several that were still working in the shitamachi area. Not visible in these pictures was the very scary acrid (not damp) smell (its cause?....). (Below left) - The entrance closest to the bridge is one of two entrances to the tourist information office, and the entrance on the left side of the building leads to, first, stairs going up on the left (second photo below), and then, to stairs going down (shown further up this page) on the right at the end of the passageway. After coming out of the basement, I went back to the first floor information center to tell them I'd finished my self-guided tour, and then I exited the front corner door, trying (not very successfully) to imagine how the building had been as a kimono shop in 1929, before the winds of war had begun. Most pictures of the the Atomic Bomb Dome I've seen focus exclusively on the dome at the expense of the rest of the building. Just another case of everyone jumping on the same picture bandwagon I guess. Looking head-on at the building (right below), you can see the building's outline and imagine (somewhat) its original shape. It seems to have been made of a combination of stone, brick and wood - there's no trace of any flooring left at all - just the walls of (mainly) the front central part of the building. Two days (a day and a half really) is not enough to get to know a city in detail - next time I hope to spend more time in Hiroshima to discover the areas of the city I have yet to visit, and to... learn more. Not long after coming out of the Rest House, I took a boat trip and then a different type of Shinkansen super express back to Tokyo. Here is a much more detailed versioin of Eizo Nomura's account that found on-line in 2014. The link has since gone dead, but it seems to match some Japanese language posts I've found, so I think it's accurate and a fairly decent translation. "Covering a small space of about one third of the floor area, which was a little over 10 tsubo (approx. 33.1 square meters), the basement was always illuminated with electric lights. After looking for documents here and there in vain, I finally came to the safe under the stairs in the basement. That was when I heard quite a loud boom. The lights cut off the moment I heard that sound. At the same time, a few solid objects like pebbles hit my head. Ouch! Placing my hand on my head, I felt some kind of thick liquid trickling. Blood! Wondering what had just happened, I checked my upper body, arms, feet and other parts to see if I had been injured someplace other than my head, but my body didn't seem to show any signs of abnormality. In the basement, it was pitch dark and I couldn't see a thing. I was standing at a point right under the stairs. I put my foot on a stair trying to climb the stairs. I took a few steps up, but it felt weird. The stairs no longer maintained their staircase-like structure. They appeared to have been transformed into a slope upon which lay a jumble of pieces of wood, fragments of roof tiles and sand. Under my feet was a soft substance like a straw bag. Sensing something was strange, I gently touched it. It was half buried under the sand. Oh! It was a person! Holding the person in my arms, talking to him/her, I did everything I could, but his/her head just kept facing down. He/she seemed to have already died. As soon as I understood that, I felt shivers through my body. Then, the voice of a man calling for help came in from the darkness at the back of the basement. After the voice had called for help a few times, it turned into cries and moans. Hurrying up the slope, I hit my head on something above me. I touched it with my hand - it felt like a concrete wall. I pushed it with both hands, but the wall wouldn't move one bit. It seemed that we couldn't get out of the basement! Enveloped in a desperate feeling like I was dying, the faces of my four children flitted through my mind like a kaleidoscope. I don't remember what happened after that, or how or from where I got out of the basement. Then, the next thing I knew was that I was standing on the first floor. A person was on one of the window frames on the first floor. My eyes saw the person as a black substance like a silhouette. I could not tell anything about the situation on the darkened first floor, but it felt like a jumble of scattered things, such as overturned cabinets, desks and chairs. I pushed my way through the jumble to the window, and asked the figure, "Who are you?" He answered, "I'm Hirose." "Oh, Hirose. What can you see outside?" I asked. "There's a road," he answered. "OK. Is it possible to jump onto it?" "Yes, it is," he answered. "Jump! I'll follow." Then, we were standing on the road outside. It was dark outside, enveloped in a deep-black smoke. It was like a half-moon night. Taking another look at Hirose, I saw he was bleeding from his face and hands. We hurried to the Motoyasu Bridge. Casually looking for the bridge, I saw a stark-naked man lying on his back and shivering at a point just before the center of the bridge with his hand and legs stretched toward the sky. Then I saw something round burning around his left armpit. The other side of the bridge was enveloped in black smoke, in which flames seemed to begin rising in some places. So, instead of crossing the bridge, we ran in the direction of the present-day Peace Tower. The area was a site of house demolition work, and was transformed into an open space, part of which provided a vegetable garden. Hirose and I went to the stone steps leading down to the river, and sat down there. Until we sat down, I had been half desperate. Looking around, I saw black smoke everywhere on the ground and in the sky. In the thick smoke, the building of the Hiroshima Prefectural Fuel Supply Control Union, from which we had just been able to escape, was looming. The Hiroshima Prefectural Industrial Promotion Hall was also standing in front of us on the other side of the river. I could also see the Commerce, Industry and Economy Association on the far left. Flames, which had been burning in the smoke, were gradually growing. However, those three buildings had yet to catch fire. After a while, the window frames of the Fuel Supply Control Union began to burn. After all the windows of the building had caught fire, the flames crept into the building. Then, after a little while, the Industrial Promotion Hall followed in the same manner. Before long, fires at the windows of the Commerce, Industry and Economy Association began burning toward the inside of the building. I believe that the Commerce, Industry and Economy Association was the last building to begin burning, and Hiroshima Post Office was the first. With some other escapees from the Fuel Supply Control Union joining us, we became a group of eight - four men and four women - including myself. All of us, sitting down on the stone steps, gathered together in one place. Each of us was suffering from our respective external injuries and mental trauma, with a woman claiming that she was losing sight in one eye, a man claiming that he was feeling sick, and a person complaining of a headache. However, no one moaned in agony. Most of us remained silent. As the fires increased in force and size, our bodies felt hot. The river water level at the high tide was gradually dropping to the level of the ebb tide, and we moved down the stone steps one by one. The black smoke of Hiroshima Post Office, which was diagonally opposite from our location, billowed high up in the sky like a tornado. Sometimes, the smoke tornado leaned over our heads and belched some burned galvanized iron sheets and scorched pieces of wood upon us. The situation was so dangerous that we were having to dodge falling objects, but to do so, we had to look upward. Once the smoke got into our eyes, they stung with pain causing tears. Once we inhaled the smoke, our throats became choked up. So I took the secondhand towel hanging from my waist and spread it over my face. This made it somehow easier for me to bear the pain in my eyes and to breathe. Since I had picked up some burned galvanized sheets from among the falling objects and given them to the other members, all of us could cover our bodies as protection from the heat and the danger of being hit by the falling objects. Suddenly, a section of the Motoyasu River swelled, spiraled into a column, and rose high up in the sky. A water tornado! The tornado trailed water downwind. Still, the force of the fires was fierce. Smoke from the bank across the river harried us along with sparks from the fires. As soon as we had all reached the open space, after we climbed the stone steps screaming to escape from the attack, sparks began to pour down on us. We had no choice but go back to the corner of the stone steps, which served as a stone wall, stick tight together. We survived the imminent danger by alternately soaking the galvanized sheets in the river and covering our bodies. We heard a sound like an explosion of an oil can over ten times both far and near. We were scared by the sounds, wondering if they were explosions of time bombs. Over time, large raindrops began to fall, which gradually turned into a downpour. It was every man for himself, as each of us searched for a place to hide and took shelter from the downpour. However, most of us got drenched to the skin. When the downpour let up, we began to shiver and our teeth chattered. Then, we drew near to the fire to warm our bodies. Twenty to 30 minutes later, we finally felt relieved. Here we were, in the height of the August summer, and at the center of a big fire, having to draw near to the fire to keep warm. What on earth was going on? The downpour had chilled our bodies so much that we had no choice. In the meantime, the central part of the fire was dying down. However, when we went to the Aioi Bridge, we were surrounded by thick smoke and fierce fires. Kamiya-cho and eastward were no longer visible through the smoke. The direction of the First Infantry Supply Corps (104th Chugoku Unit), the Chugoku Regional Military District, and the southwest direction were smoky as well."